The Esplin family who have always owned a share in the stallion since he retired after winning the stallion making Group 1 Galaxy for trainer John O’Shea, “We have always loved him since the day John bought him from us at Magic Millions. 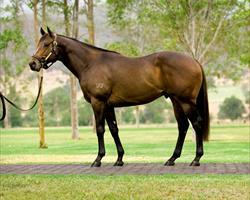 He can produce colts, fillies and his daughters look to be very valuable broodmares of the future,” Hamish Esplin said. Several shareholders have elected to retain their shares in Charge Forward and will continue to support him in the coming seasons.